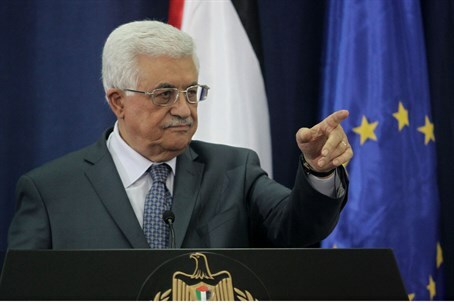 Abbas says that the PA has gotten nothing out of peace negotiations with Israel, blames "the Israeli side." Palestinian Authority (PA) Chairman Mahmoud Abbas said Sunday that despite efforts by Secretary of State John Kerry, the PA has so far gotten nothing out of the ongoing peace negotiations with Israel. As he usually does, Abbas blamed Israel for the lack of progress in the peace talks, the Bethlehem-based Ma’an news agency reported. "The problem is with the Israeli side and not with us," Abbas was quoted as having said in an interview on Moroccan television following the Al-Quds (Jerusalem) Committee meeting in Marrakesh. He referred to Israeli residents of Judea and Samaria as "invaders" with "no right to Palestinian land”. Abbas also stressed that Palestinian Arabs living inside what is now Israel "were on the land 1,500 years before Israel was established." “This is why Palestine can never recognize Israel as a Jewish state," Abbas declared, according to Ma’an. Abbas also slammed Israel on Friday, during a meeting of the Al-Quds Committee, when he accused Israel of using peace talks as a "cover" to “expand settlements” in Judea, Samaria, and Jerusalem. The U.S.-brokered peace talks must "not serve as a cover for the expansion of Israeli settlements in the occupied Palestinian territories," said Abbas. "There can be no peace without stability, nor agreement without occupied east Jerusalem being recognized as the capital of the Palestinian state," he declared. In Sunday’s interview he also referred to Israeli reports that Prime Minister Binyamin Netanyahu had asked Kerry that Israel retain a fourth “settlement bloc” – the area around Beit El, north of Jerusalem. Abbas called this kind of shift in borders "unacceptable," according to Ma’an. On Saturday, Muslim nations urged the international community to put pressure on Israel to stop construction in Jewish communities in Judea and Samaria. "The international community must... put pressure on Israel to stop the illegal and provocative settlement construction," a statement said at the end of the two-day Al-Quds Committee meeting. Restricting building projects which benefits Jews in the region "will create a favorable context for the pursuit of peace negotiations" between Israel and the Palestinian Authority (PA), it said, and for relations between Israel, its Arab neighbors and the Muslim world at large. Abbas, who constantly accuses Israel of sabotaging peace talks, has thus far refused to budge on his demands and has refused to recognize Israel as a Jewish state. Last week, he told a delegation that there will be "no peace between us and Israel" without eastern Jerusalem as the capital of the future Palestinian state. Abbas was optimistic about one thing in Sunday’s interview: the chances of a reconciliation between his Fatah party and its longtime rival Hamas. If Hamas agrees to hold elections, there will be reconciliation "tomorrow," Abbas said, according to Ma'an. He said Hamas has "used the excuse" that the Americans and Israelis would refuse to negotiate with the PLO if Hamas were included, and thus would pressure Abbas against reconciliation.